Saturday, after handing out my campaign brochures at the farmers’ market, Walmart, and showing off my MAGUIRE for COUNCILLOR t-shirt at a friend’s party, I stopped into the Woike farm for a debrief on the day. While I was there, Josh Mellor showed up for a chat. Anyone whose been to the Cowichan Exhibition will be familiar with the Mellor name. The expansive Mellor Hall was named after Josh’s more-senior family members. Many a CowEx blue ribbon has been won in Mellor Hall. Josh is the next generation of farmers in the Mellor family. He’s 32 years old. 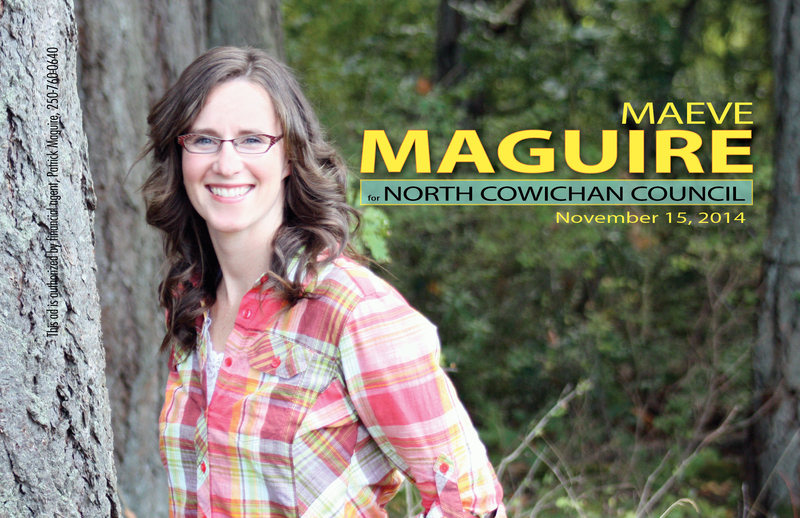 We were talking about me running for North Cowichan council. I asked Josh if he had any ideas or concerns about council he’d like to share. Without a moment’s thought he said he wanted roadside signs telling cars to be considerate of tractors driving slowly. He’s often driving up and down Herd Road, where his family’s 100+ acre farm sits, in a slow-moving tractor. He says, in his colourful way, drivers often give him gestures of unkindness as they pass him and cut in front of him. Who in their right mind would say no to that? Spot the non-farmer in the pink rain jacket squeezed into the cab of the tractor. My seat. Even before kids I wouldn’t have fit. Handy little side table—for a small child. This is us filling up the tank (known in the agriculture industry as the honeywagon) with cow manure from the swimming-pool-sized vessel full of it. They spray the manure as fertilizer on their fields. That’s the swimming pool of poo. No one made unkind gestures towards us but as we were (slowly) delivering the manure to his farm up the road, Josh and I had time to talk. He told me he works as a heavy-duty mechanic to support his farm habit—farming alone won’t pay the bills. Other family members also work away from the farm to support it. I asked if he thought there was a food-security issue on the island. I can’t repeat exactly what he said (again) because of his entertaining language choices, but, in summary, he confirmed we wouldn’t have many days of food if we were cut off from the mainland. He said in a crisis the farmers will be fine because they’ll have food to eat and trade; it’s the rest of us who should worry. 1. Slow down for tractors and don’t pass a tractor unless it’s safe to do so. 2. Make friends with Cowichan Valley farmers. They may save your life one day. 3. Agriculture is a foundation of North Cowichan. Every decision-maker in our region needs to take a ride on a honeywagon. Good story…One other thing about farm vehicles; never follow a manure spreader too closely. You see?! It pays to know your farmers. I’ll sleep better knowing that, thank you Heather.